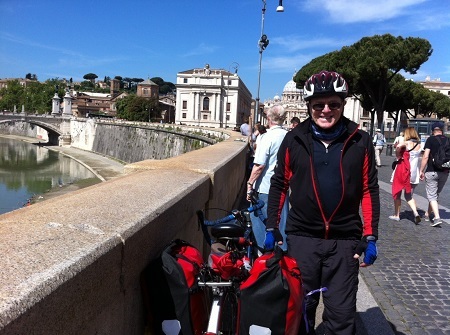 A big thank you to everyone for all the support as Peter and Eugene take on their Trans Canada Adventure! A special big thank you goes out to Eoin Reilly for all his help on setting up “Where Is Grandad Now?” webpage, twitter and linking everything together…and working for long hours with dad trying to see where live feeds from the GPS could link in to! Eoin has always given so much time and effort, into running this page, and all the hikes and fundraisers over the last 7 years. A big thanks Eoin from the family. Starting August 19th, Peter will take on his biggest challenge to date, cycling west to east across Canada! Fun Fact- The Trans Canada Highway, is one of the longest continuous routes in the world!! Stage 1, Victoria-Ontaria totals approx 5,400Km. Stage 2 Ontario-Newfoundland totals approx 3,500Km. SS1 - Rome - Vatican City - pallidoro - san severa - san marinella - Civitavecchia - allumiere - Tarquinia - montalto di castro - orbetello scalo - albinia - fonteblana - respecia - Grosetto - follonica - venturina - san vincenzo - donoratico - Cecina - Livorno - Pisa - Viareggio - lido di camaiore - Massa - Sarzanna - La Spezia - rico di golfo - botghetta di vara - sestri levante - lavagna - chiavari - rapallo - recco - nervi - Genova - pegli - voltri - arenzano - varazze - celle ligure - albissola marina - Savona - carcare - millesimo - ceva - SS546 - san michele - mondovi - Cuneo - SS20 +SS21 - borgo san dalmazzo - demonte - vinadio - argentera - Col della Madeline - D900 - Col de Larche - Larche (France) - meyronnes - condamine ch. - jausiers - Barcelonette - revel - le lauzet - ubaye - D900b - tallard - D85 - Gap - D994 - la roche - veynes - aspres sur buech - D993 - beaurieres - luc-en-d - D93 - moliers glandaz - Die - vercheny - aouste - Crest - D538a - montmeyran - beaumont - Valence - D86 -st peray - Tournon - st jean-de-muzols - sarras - andance - D82 - Annonay - st marcel - bourg-argental - St Etienne - D10 - andrezieux-boutheon - Montrond-les-Bains - feurs - balbigny - neulise - Roanne - D982 - pouilly s/s ch. - iguerande - marcigny - st yan - Digoin - D979 - st agnan - gilly - cronat - charrin - Decize - D981 - st leger de vignes - imphy - Nevers - D45 - fourchambault - D920 - sancergues - Sancerre - D951 - beaulieu - chatillon-sur-loire - Gien - sully - tigy - jargeau - st denis-de-la-h - mardie - st jean de-b - Orleans - D357 - ouzouer le-marche - moree - les fontains - st calais - bouloire - Le Mans - loue - vaiges - Laval - D30 - le bourgneuf-la-foret - D798 - dompierre-du-chemin - Fougeres - st james - pontabault - Avranches - D235 - Coutances - D2 - Lessay - D900 - la haye-du-puits - sottevast - D50 - brix - Cherbourg- Octeville. - Irish Ferries - Rosslare (Ireland) - Wexford - ballyedmond - Gorey - inch - Arklow - wooden bridge - Avoca - Rathdrum - Laragh - Glendalough - roundwood - enniskerry - dundrum - Dublin - lucan - Leixlip. - 2,500 kms.